The very first time I ate Muchin, I fell in love. The rich sweetness of baked bananas, Lady Fingers to be precise, also called Chileanas and Horitos in Ecuador, blended with aromatic spices like anise and cinnamon, with fresh farm cheese in the middle and wrapped in a bijao leaf before being slowly baked over hot coals. It was love at first bite. In the village where I live, muchin is a weekend treat. On Fridays, Saturdays and sometimes on Sundays, vendors sell this traditional coastal dessert on the street. It’s the perfect snack for late afternoon, though I’ve been known to buy two and eat them both for lunch accompanied by a fresh papaya juice. Despite appearances, Muchin is very easy to make. The hardest part is the collection of bijao leaves. These broad leaf plants resemble banana tree leaves and have a white film on the back. The film is removed and the leaf subsequently sterilized by running it quickly over the flames of the cooking fire. Get the fire ready first so it has time to burn down to glowing coals. Cut the leaves, taking out the center stem, but saving it for the ties. Each bijao leaf is enough to make four muchins. Cut the stem into fine strips and put them aside. You will use these to tie the necks closed. Mix the three types of bananas together, then add the butter and mix well. Sift in the flour and spices and blend well. 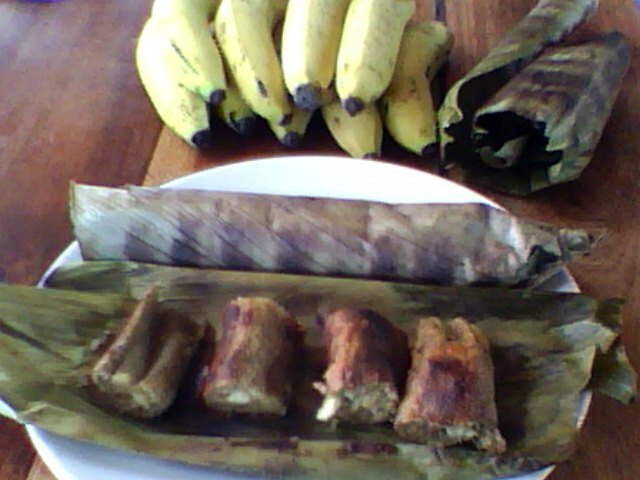 On each quarter of bijao leaf, place one large serving spoon of the banana mixture. Place a strip of cheese in the center. Now, roll the leaf closed, carefully folding in the bottom end to make sure it’s well sealed. Tie the neck of the other end with the stem strips. Trim the rough ends before placing them over the coals to cook for 35-55 minutes. They feel solid to the touch when cooked. Be careful when you unwrap the leaf, the muchin is extremely hot. Fancy a one-on-one cooking lesson in an Ecuadorian kitchen? Ask Footprints.